Van Cliburn Interview with Bruce Duffie . . . . . . . . . 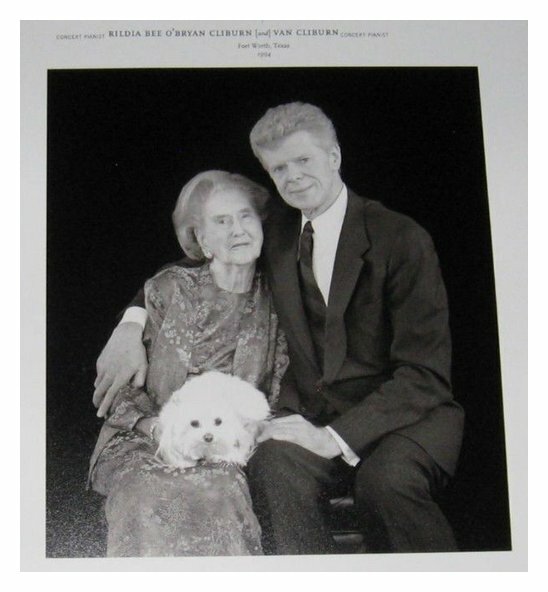 The achievements in the long and distinguished career of Van Cliburn are well known, so rather than elaborate them here, there is a box at the bottom of this webpage which goes into the details. Being a Chicagoan, it makes me proud to know that we arranged for his appearance before he gained world-wide notoriety. 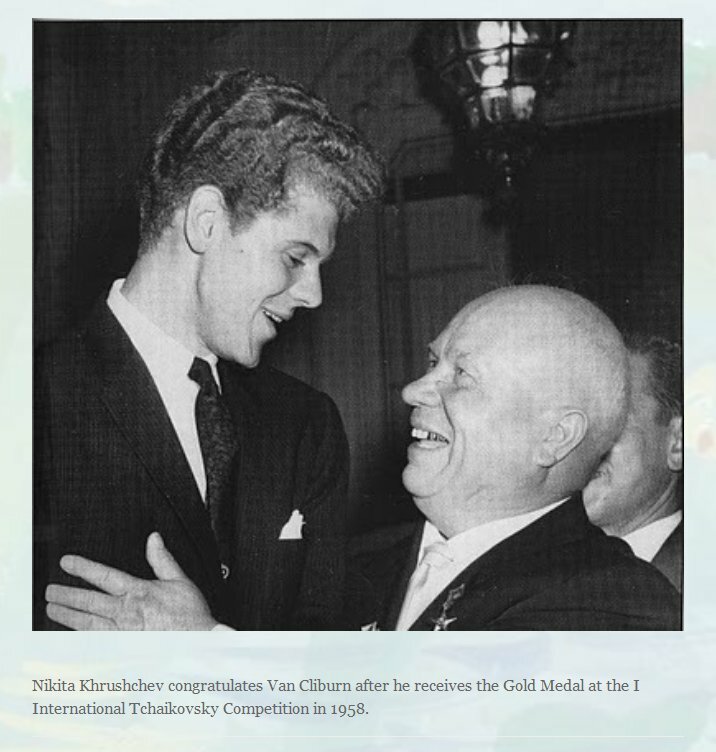 Between the scheduling of Van Cliburn's 1958 Grant Park Music Festival appearance and his actual July 16 appearance, he won the First International Tchaikovsky Competition in Moscow that April. He was catapulted to international fame for winning one of the world's elite music competitions, and as a result, he was greeted with a celebration that included a ticker tape parade down Michigan Avenue, and his Grant Park Music Festival appearance was a major event. He returned to Grant Park in June of 1994 to open their 60th season with the Tchaikovsky Piano Concerto #1 conducted by Leonard Slatkin, and it was during that visit that I had a chance to sit down with him and have this conversation. He was quiet and sincere in his responses to my questions, and he allowed great insight into his ideas and feelings for his artistry and profession. As usual, names which are links refer to my Interviews elsewhere on this website. Here is that encounter . . . . . . . . .
Bruce Duffie: When you listen to a young pianist, what are you listening for? 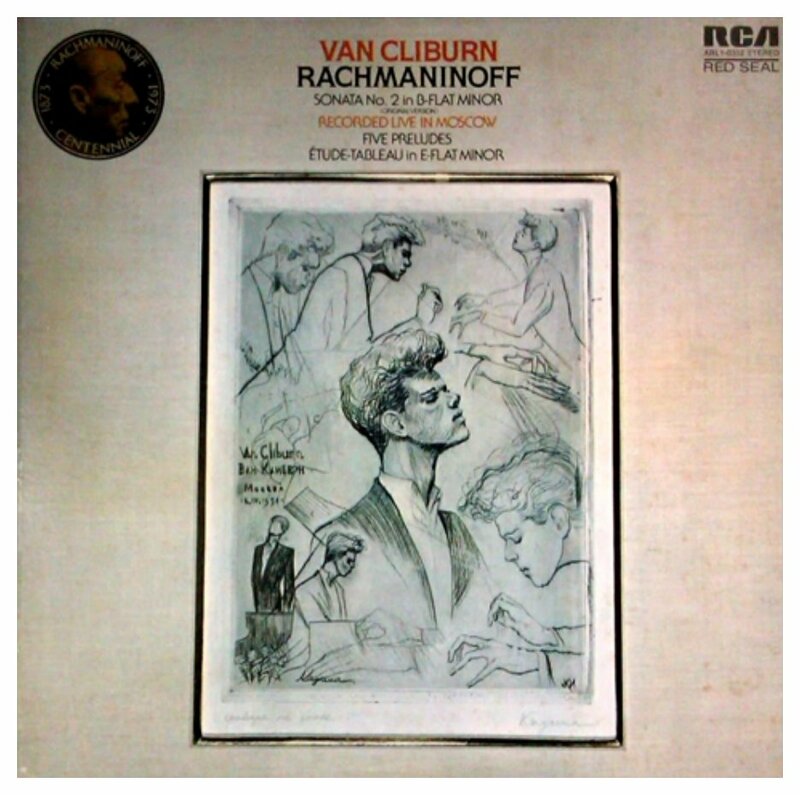 Van Cliburn: I’m listening for their communication of the music, and their love for the work that they’re conveying. I feel very strongly that when you are a performer, you are a servant. BD: Of the music or of the public? VC: Of everything. You are there to serve. There are only two reasons for you to be on the stage — to lift notes off of a printed page and serve them to an audience that is comprised of many professions and many backgrounds. That’s the first reason. The second reason is out of that many professions and backgrounds, there are members of the cognoscenti, and they will want to know what you think of that particular piece of music. So those are the only two reasons for you to be there. It is not for you. You must love the work or works that you’re going to play. There are many ways to say the same thing, and the only thing that you’re listening for is a clarity of communication. BD: You say there are many ways to say the same thing. Does your idea of how to say it change over the years? VC: No, because I’m a very good listener. When I am on the stage, I am to serve. When I go to a concert, I’m to be nourished. BD: But I mean your idea of a piece, and how to present it. VC: No. What a good listener does, even if they have performed a certain piece, they must go, because if you play it the same way I think about it, then I don’t know how you feel about the piece. BD: So the different ways are from different interpreters? VC: Yes, yes. The only thing is you want it to be clearly conveyed. BD: But if you hear another idea that you think is perhaps better, would you not alter the way you play? VC: That’s the beauty of classical music — you’re always studying the piece. You may have played it many times, but with each re-hearing of a great piece of music you hear something and see something that you didn’t the time before. This is an uncanny realization of great music. That’s why it is called ‘classical’. BD: Then how do you decide which of these bits of ‘uncanniness’ you will keep, and which you will discard? VC: I don’t think we discard anything in life. Many times we will weed out, because your perspective all comes together over time. Classical music is like a prism, a kaleidoscope. You turn the prism, and you see many different colors. It’s always turning, so that the timelessness and the agelessness of it permit you to see different facets of the same piece of music. BD: So then are you sending the light into the prism, and letting it break up in different ways? VC: The music itself is the light, so that it radiates itself. It’s a wonderful thing, and I’ve thought about this many times. Since 385 BC, when Plato established the Academy of Learning in Athens, the curriculum vitae was built on the trivium and the quadrivium. The trivium was composed of language, rhetoric, and logic. The quadrivium was arithmetic, geometry, astronomy, and music. Music was the highest of the seven disciplines, and when you think about great music, it is the one form of art that is truly universal. It needs no translation. But on top of that, it is indestructible. If it is great, a bad performance will never harm a great piece of music. BD: What are some of the threads that make a piece of music great? VC: There are only two criteria. When you and I, any human being, sees anything, it’s first emotional, not intellectual. The intelligence comes second. But if it has equal parts of emotion and intelligence, it’s a masterpiece. If you have too much emotion, you have no architecture. If you have too much intelligence or intellect, you have no substance. BD: Are there a lot of pieces of music that fit this balance? VC: I think all of the great compositions are equal balances of emotion and intelligence. BD: [Playing Devil’s Advocate] But we have more pieces of music in the classical literature than just the greatest. How far do you let it go before they fall off the edge, one way or another? VC: I don’t think anything ever falls off the edge. If something is deeply loved by the world and embraced by the world, if you look at the piece of music very carefully, there’s a very good reason. It has great structure, great architecture, great directness of meaning, great sensitivity, and a compelling quality. Every one of the great, great, totally universal pieces of music has that. BD: But some pieces come in and out of fashion. VC: There are no fashions in classical music. People like to make fashions, but for a performer or sensitive people who really know, deeply know, there are no fashions. BD: Is the quantity of classical music continuing to grow? VC: That will only be known by the test of time. Time tells all with classical music, as it does with any art. BD: Are you optimistic about the whole future of musical composition? VC: Yes, as long as the composer always bears in mind that any great work of art was created for another human being. BD: From this huge array of pieces, you have to decide which ones you will play. How do you decide which ones you will learn? VC: That is a very subjective and personal matter. First of all, it depends on the performer’s ambition. I know performers who wish to play everything in the repertoire. That’s fine, except for the fact that since we know that music is to time what painting is to space, even if I had all the means in the world to go into an art gallery and buy ten Renoirs, or ten of any artist, because I am a human being I don’t believe that I would love each one equally. So from just a personal standpoint, everything that I would want to play I would want to love very much, because when you take a great piece of music into your mind and your heart, that is forever. Classical music is a vocation; it is not a business, and when you begin and have your first steps in your musical odyssey as a very small child, it’s very important to remember that it is forever, no matter how life goes. That is so wonderful! I was reading an article about a young performer who had come as an émigré to this country. The reporter was asking, “What is your American dream?” and he said very simply, “I hope I can survive in this new country.” [Both laugh] But then he said, “My American dream is a very small one, but very constant. My American dream is to remain a musician.” That is profound! BD: So you strive every day to make sure that you are a musician? VC: Well, anything that says the most in the least amount of time is classic, and each canvas, whether it’s an etude of Chopin or the smallest prelude, is a large canvas. BD: But I was just wondering about the idea of being classical, because we have all kinds of different musics around. VC: Yes, that’s true, but that is my profession, classical music. This means any piece of music that has lived, has longevity, has the qualities. When we think of the American musical theater, we know the writers that have been so terribly famous. They have given us their melodies and their songs that have made such an indelible mark on our lives! They have become classics. BD: So they should be played in the concert hall, also? VC: They are many times, as we know, but I’m speaking strictly about what has that quality of longevity that becomes classic. I feel that the composers today are writing for fellow composers, and I’m not so sure that this is the proper goal. I feel that you can have beauty and you can have intensity. You can have all of that, but it can be very intelligent. How dangerous it is to think that when you’re writing in the conservatory for your friends, members of the cognoscenti, if you are writing only for them you will have missed your calling. BD: In the competition which bears your name, you always insist that there be a new piece included. BD: The last one was Morton Gould, I believe? VC: Yes, Morton Gould. He wrote a wonderful piece, Ghost Waltzes. BD: Do you, yourself, also play those new pieces? VC: I have, yes. We also had a wonderful one from Leonard Bernstein. We have been very fortunate. VC: No. We give a rough time frame, but in any kind of style whatever. We give great latitude. BD: Then how do you select which composers you are going to ask? BD: These, of course, are all recognized composers. BD: When you present a solo recital, do you try to include a new piece on the program? VC: [Sighs] I am not making it a special attempt, no. If I feel that it is something that I want and it fits the program or the tenor of the evening, yes. BD: How do you decide, then, between a lot of little short pieces and a great big sonata? VC: I don’t know. It’s probably the way that artists have been doing it for years. If you look back at programs, they have been quite varied over all the artists. BD: You’ve made a number of recordings. Do you play the same way in the recording studio as you do in the concert hall in front of a live audience? VC: I have recordings that were live, and I have recordings that were in studio. I think you convey the music. Fortunately, we have subtle miking. It’s not miking in a sense, in the respect, so that the studio is made to feel like a concert hall, but you must concentrate, and realize it as if it were. BD: Are you putting yourself in the listeners’ place, in their living room? VC: Yes, because you’re always trying to gage it that way. When you perform something, you are the host for the evening, and it is your duty to present and to serve this music. BD: Have you ever performed any of these pieces absolutely perfectly? VC: I don’t think anyone ever has. Rachmaninoff said two things that were wonderful — “A lifetime is not enough for music, but music is enough for a lifetime,” and, “Great music is so wonderful, but the horizon is always receding.” So your quest for it is there, but naturally it cannot be perfect, because we live in an imperfect world. We are human beings. BD: You’ve played for small audiences and tremendous audiences. Is the music that you play for everyone? VC: Oh, yes. And isn’t that marvelous? It is absolutely universal. Plato had the right idea when he said that music was set free. It is free. BD: How can we get even more and bigger audiences into the concert halls? VC: This has to do with going back to education. We must realize that music is a language. It is readable, writeable, and recite-able. Can you imagine the joy that a young child would have for the rest of his or her life if they were to come in contact with music? You realize that music, a pure sound, has an eye, and if a child could be shown or made to concentrate on the eye of a sound, a pure sound and sounds together comprising the three rudiments of music — melody, harmony, and rhythm — that child’s life would be transformed because music can stimulate both sides of the brain. It creates the atmosphere and the need for concentration, and concentration is nothing more than automatic discipline. BD: And yet the levels of concentration, even in a small audience, are going to be so varied. BD: Is music your religion? VC: It’s not a religion, no. It is a mandate for human beings. BD: So it’s in addition to your religion? BD: Is it in addition side by side, or is it all wrapped up and intertwined? VC: Music is part of life. It is part of humanity, but it’s an enriching thing for humanity. Music serves religion, but music is an integral force of life. BD: When you go to a concert, you can’t travel with your piano. Horowitz used to, but I assume that you don’t. So how long does it take before the instrument in front of you is your own? BD: Some, obviously, work better than others? VC: You can feel closer to this one or that one, but you must try for that moment that you have to serve. You must do everything to make it work. You must not judge, you must not compare the piano at the given moment to anything else. You must work. It must work. BD: I assume, though, that the Steinways you play from city to city are on a very high level? VC: Yes. I love the Steinway piano very, very much. They have wonderful technicians. [See my Interview with Franz Mohr, Chief Concert Technician for Steinway & Sons 1968-92.] Of course, pianos are human, too, in so many ways. You will find wonderful pianos everywhere, but some you will turn to and remember with great affection. BD: I assume, though, it’s a little different if you’re playing an outdoor concert as you are here, with the heat and the humidity, as opposed to an indoor concert where there’s a little more climate control. VC: Yes, outdoors is different, but this can be a variable anywhere. BD: Even in a concert hall??? VC: Oh, yes. I’ve seen it happen. You can never be sure of anything, because even from an orchestra rehearsal in the same hall and you’ll think that was wonderful, or you may not like the piano, and you get to the concert and you may like the piano or not like it. It’s very interesting. BD: Is it being temperamental, or are you being temperamental? VC: No, no! The moment, the vibrations, the electric effect of the audience, the magnetism of the whole moment of the evening can change. I’ve seen this happen many times. BD: You are a Steinway artist. Have you also played on Baldwins and Bösendorfers? VC: No, not publicly, but I’ve played many. BD: Are they also excellent pianos? VC: When my mother was going to the Cincinnati Conservatory, they had Baldwins in the school. The family was very involved in the school, but we always had Steinways at home. I’m just very fond of Steinway. BD: People grow up learning on various instruments. Can they become fine artists even on other instruments? VC: Oh, of course. The instrument doesn’t have to do with it, no. The piano is the piano. Music is the objective. BD: You go to other concerts. Do you enjoy hearing orchestral concerts, or operas? VC: Opera is my favorite form of music. The human voice is the instrument that every instrumentalist takes his cue from because it was the first instrument. So we always look to see a human voice when we approach anything... at least I do. I always look at it from the standpoint of how would you breathe, how would you phrase, how would you project a melody? It has to be singing. Some of the great literature is the vocal literature. We have a wonderful vocal series on the concert series in Fort Worth, and we have all the great singers for recitals. BD: Do you ever try to participate in this? VC: No, I don’t participate except as a listener. That’s much more pleasure for me. BD: Is playing the piano fun? VC: I love playing the piano. I did a lot of concerts as a boy soprano from the age of eight to eleven, and I enjoyed that so much! I really enjoyed singing. I’m grateful that I did it. There is nothing like singing. The human voice is so wonderful and extraordinary. It has a dimension that nothing else can have, but after that, the piano is the complete instrument. BD: More so than the organ, with its larger register? VC: The organ, of course, can be instrumental thunder, but we’re talking about the piano as a complete instrument. BD: More than an oboe or a flute? VC: Yes, yes. As you’re sitting down at the piano you can encompass an orchestral score. You can do a wide range of things on the piano because it’s a complete instrument. I suppose I look at music in a total effect, not just from the standpoint of a performer or purely from the stage aspect. I’m grateful I’m a pianist. I love the piano, but I love music. BD: Thank you for coming back to Chicago again. VC: Oh, I’m so thrilled to be here! I’ll never forget Grant Park in 1958. What wonderful audiences! BD: Would it have been the same if you had come in second or third in Moscow, or not even placed in the competition? VC: I don’t know how life would have been. I’ve always said that competitions are an opportunity. They are a door, they are not the room. The room is what you make when you go through the door. BD: Thank you very much for speaking with me today. 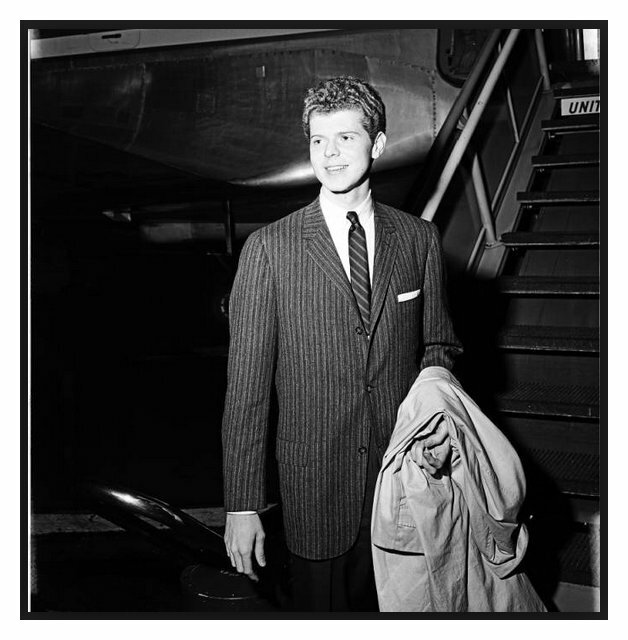 Van Cliburn (July 12, 1934 – February 27, 2013) was born in Shreveport, Louisiana. His father, Harvey Lavan Cliburn, was an executive with Magnolia Petroleum, now ExxonMobil. At the age of 3, he began piano studies with his mother, Rildia Bee O’Bryan Cliburn, a talented student of Arthur Friedheim, who was a pupil of Franz Liszt. He was 12 when he made his orchestral debut with the Houston Symphony Orchestra. After graduating from Kilgore High School in the spring of 1951, his mother wanted him to study with Madame Rosina Lhevinne at the famed Juilliard School in New York City. 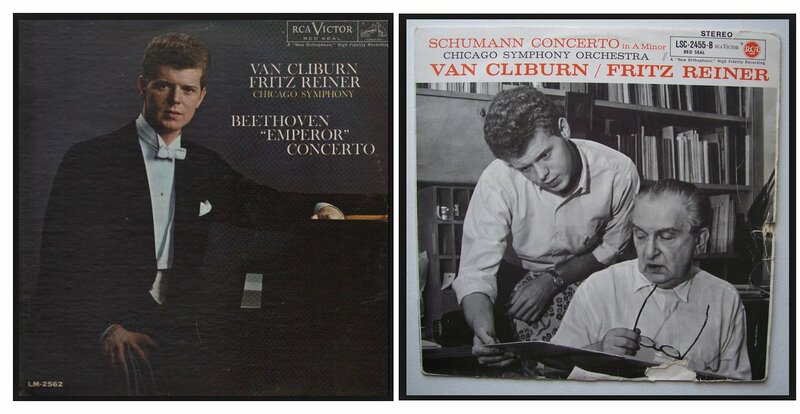 In 1954, Van Cliburn won the Levintritt Competition, which had not awarded a first-place prize since 1949. The prestigious Levintritt Competition offered important appearances with such major orchestras as Cleveland, Denver, Indianapolis, and Pittsburgh, as well as a coveted New York Philharmonic debut with the great Dimitri Mitropoulos, which took place in Carnegie Hall on November 14, 1954. He was hailed as one of the most persuasive ambassadors of American culture, as well as one of the greatest pianists in the history of music. 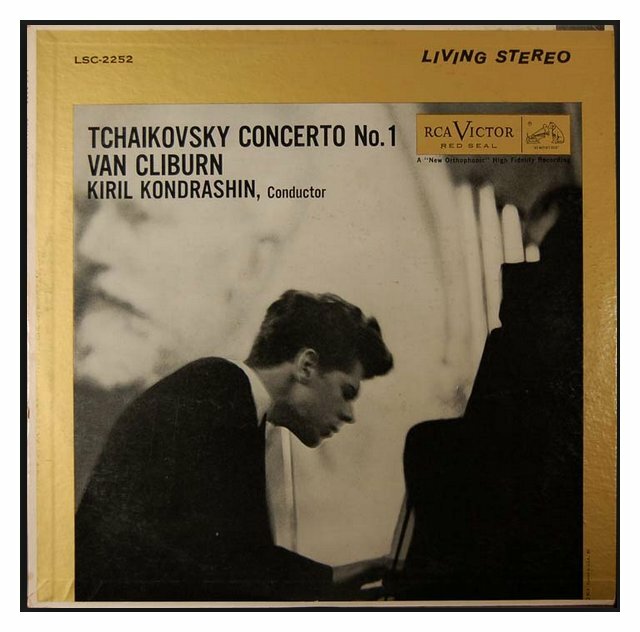 With his historic 1958 victory at the first International Tchaikovsky Competition in Moscow, at the height of the Cold War, Van Cliburn tore down cultural barriers years ahead of glasnost and perestroika, transcending politics by demonstrating the universality of classical music. Returning home from Moscow, Mr. Cliburn received a ticker-tape parade in New York City, the only time a classical musician was ever honored with the highest tribute possible by the City of New York. Upon Mr. Cliburn’s invitation, Kiril Kondrashin, the conductor with whom the pianist had played his prizewinning performances, came from Moscow to repeat the celebrated concert program with Van Cliburn at Carnegie Hall in New York, at the Academy of Music in Philadelphia, and in Washington, D.C. Their recording of Tchaikovsky’s First Piano Concerto, made during Kondrashin’s visit, was the first classical recording ever to be awarded a platinum record and has now sold well over three million copies. Following his triumph in Moscow, Mr. Cliburn played in several cities in the Soviet Union. From that time on, he toured widely and frequently with every important orchestra and conductor, in the most renowned international concert halls. 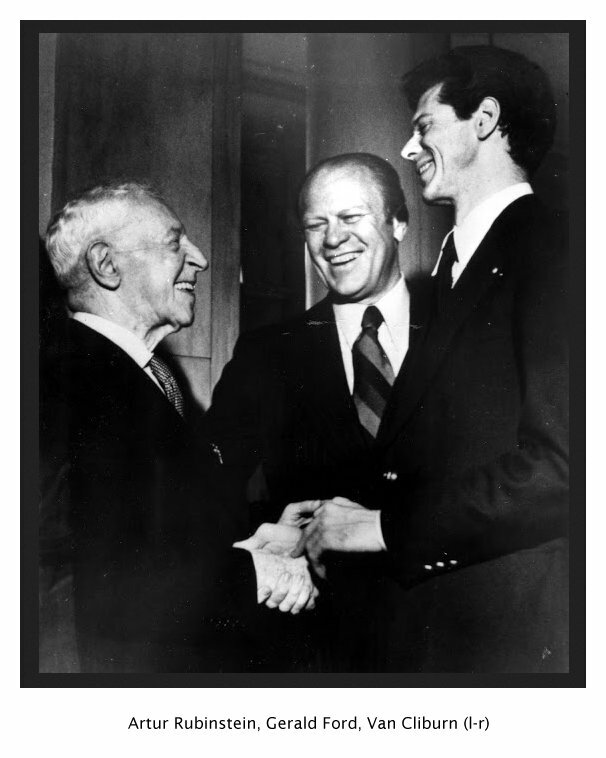 Mr. Cliburn toured the Soviet Union many times between 1960 and 1972 for extended periods. He made numerous timeless and beloved recordings, including many major piano concerti and a wide variety of solo repertoire. 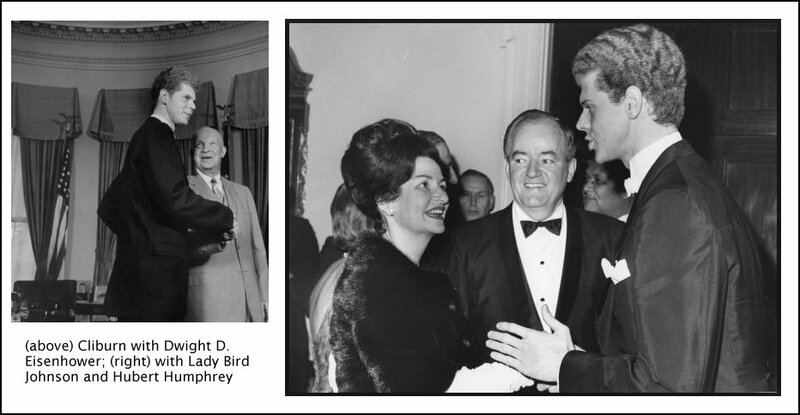 Early in his career, a group of friends and admirers began the Van Cliburn International Piano Competition as a living legacy to Mr. Cliburn’s constant efforts to aid the development of young artists. The first competition was held in 1962. 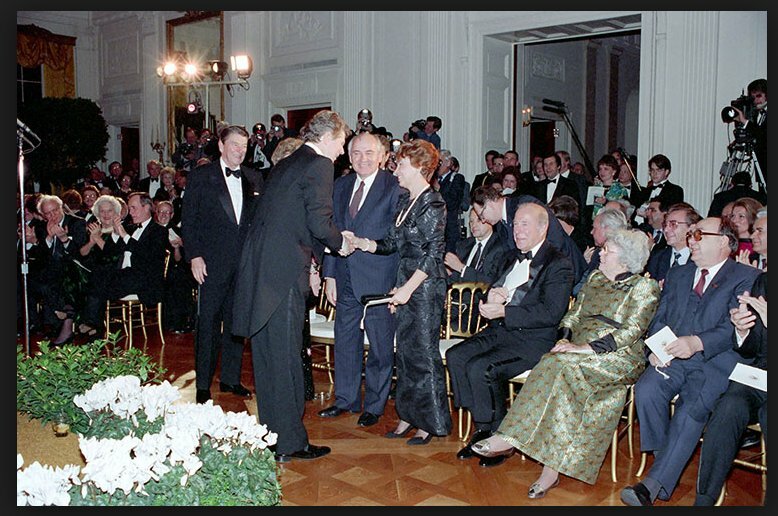 In 1987, at the invitation of President Ronald Reagan, Mr. Cliburn performed a formal recital in the East Room of the White House during the State Visit honoring Mikhail Gorbachev, the Soviet Union’s then general secretary [photo below]. 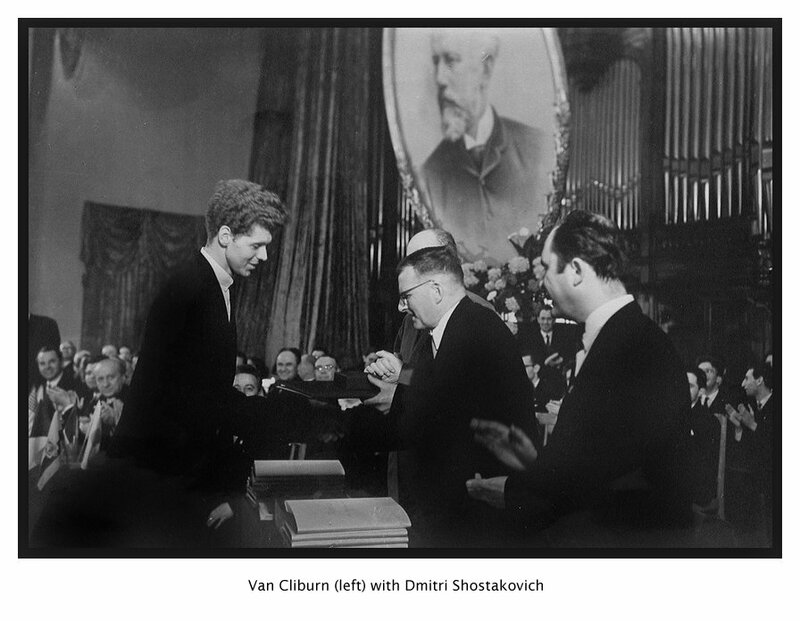 Two years later, and thirty-one years after his triumph at the Tchaikovsky Competition, Mr. Cliburn returned to the Soviet Union to perform at the Great Hall of the Moscow Conservatory and in the Philharmonic Hall of Leningrad. Carnegie Hall then requested that he play for its 100th anniversary season as soloist with the New York Philharmonic. Over the years, Mr. Cliburn has opened many U. S. concert halls, including the famous I. M. Pei Morton H. Meyerson Symphony Center in Dallas; the Lied Center for the Performing Arts in Lincoln, Nebraska; and the Bob Hope Cultural Center in Palm Springs, California. 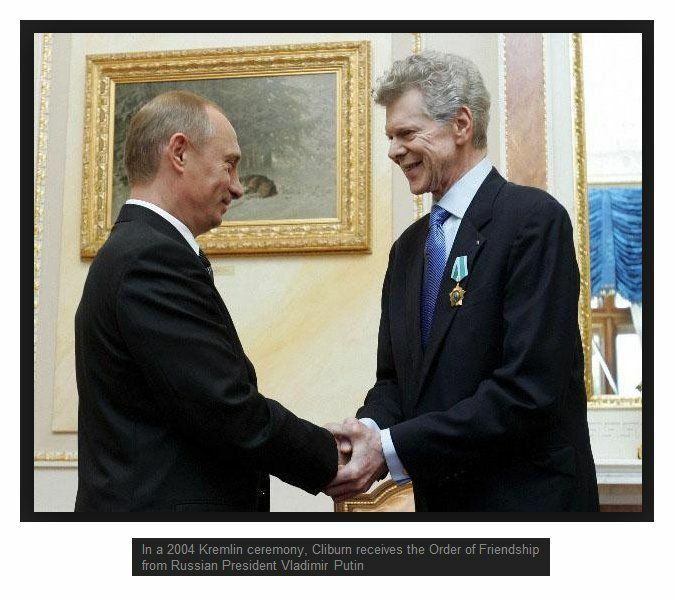 Mr. Cliburn was an honorary member of the Royal Academy of Music in London. He received more than 20 honorary doctorate degrees. He provided scholarships at many schools, including Juilliard, the Cincinnati Conservatory, Texas Christian University, Louisiana State University, the Franz Liszt Academy in Budapest, the St. Petersburg Conservatory, and the Moscow Conservatory. 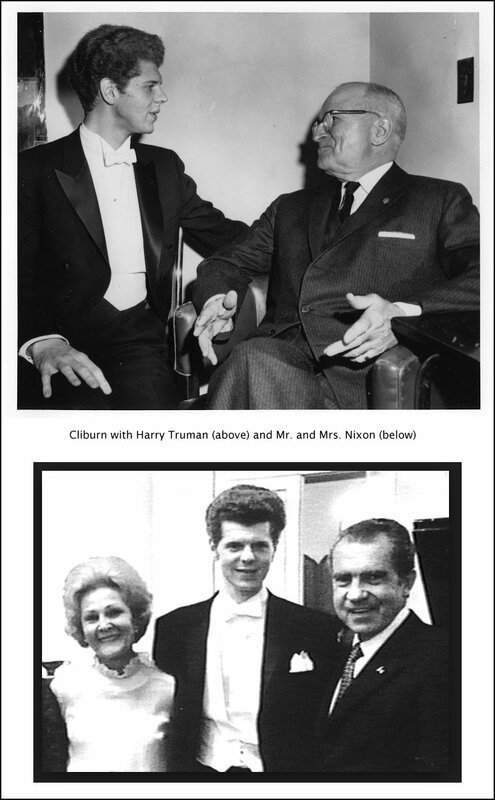 Mr. Cliburn performed for every President of the United States since Harry Truman and for royalty and heads of state in Europe, Asia, and South America. He received Kennedy Center Honors and the Grammy® Lifetime Achievement Award. In a 2004 Kremlin ceremony he received the Order of Friendship from President Vladimir Putin, and in 2003, President George W. Bush bestowed upon him the Presidential Medal of Freedom. 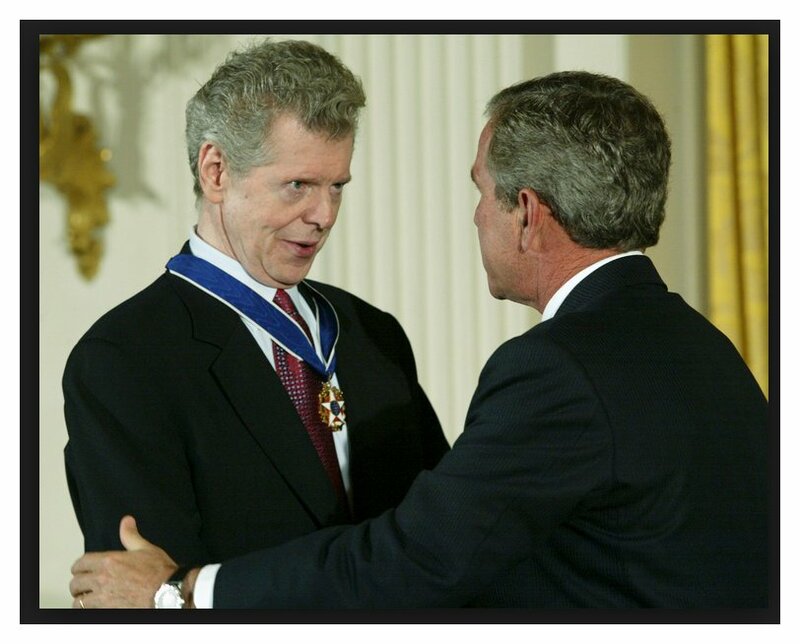 President Barack Obama honored Mr. Cliburn with the National Medal of Arts in a ceremony at the White House in 2011. Here are a few of the highlights of his long and distinguished career . . . . . . . . .
Van Cliburn achieved international acclaim when, in 1958, he won the first Tchaikovsky International Competition in Moscow, several months after the Russian launch of Sputnik, the first earth-orbiting satellite. The cultural and musical icons of Russia, a few of which were Shostokovich, Emil Gilles, Kabalevsky, Rostropovich, and David Oistrachk, felt the time was correct to bring equal attention to great classical music as had been shown to science, math and technology. The most beloved composer of the world was Tchaikovsky, whose legacy is forever a grand treasure of the People of Russia – hence, the Tchaikovsky Competition. Premier Nikita Khrushchev himself gave permission to the Soviet judges to award the prize to the 6’4″ 23-year-old Texan. In the first round, Cliburn received an eight-minute standing ovation from the Moscow audience for his recital performance, and his subsequent rounds were given equally tumultuous responses. Mr. Cliburn came home from his victory at the Tchaikovsky Competition to a ticker-tape parade in New York City. It is the only time that honor has been bestowed on a classical musician. Van Cliburn studied conducting with Bruno Walter, from 1958 to Dr. Walter’s death in 1962. It is notable that the last concert that Dr. Walter conducted was on the 4th of December, 1960, with the Los Angeles Philharmonic. The performance was an all Brahms concert with Cliburn as the soloist in the 2nd Brahms Piano Concerto. Cliburn had no intention of becoming a conductor. However, after the untimely death of Dimitri Mitropoulos, he was asked to play a memorial concert with the Symphony of the Air with Leopold Stokowski conducting. Unfortunately, an accident caused Maestro Stokowski to cancel, and Cliburn was urged on short notice to play and conduct the Concerto No. 3 by Prokofiev on March 5, 1961. This concert was a memorial commemoration for Maestro Mitropoulos, who had played and conducted the 3rd Prokofiev many times during his career. The concert was successful and Cliburn started receiving invitations to conduct concerts, which he did only 26 more times until 1966. Among the orchestras he conducted were the Philadelphia Orchestra, New York Philharmonic, Dallas Symphony, Moscow Philharmonic and the Leningrad Philharmonic, to name a few. 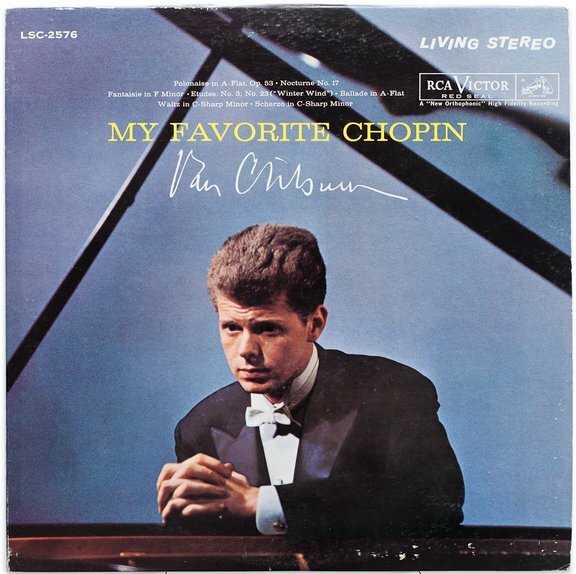 Van Cliburn’s RCA Victor recording of the Tchaikovsky Concerto topped Billboard’s chart for months, as did his album, “My Favorite Chopin,” for more than 37 weeks. 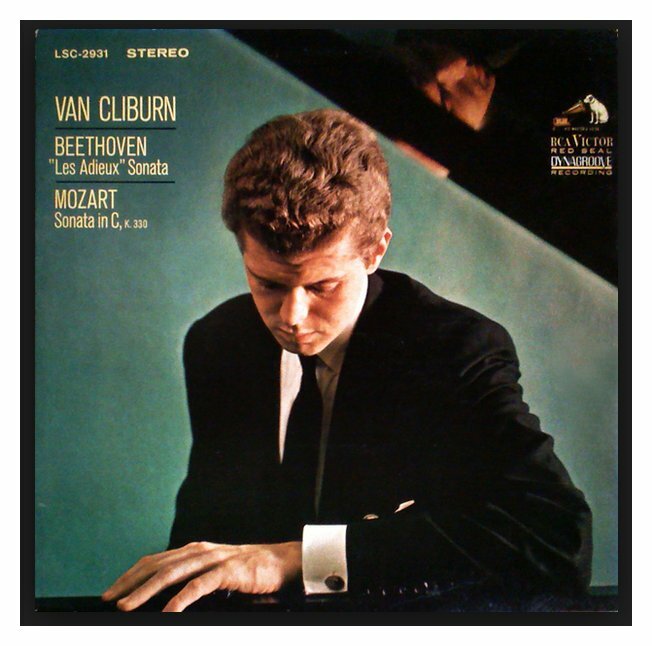 Cliburn’s recording is the first classical LP in history to sell more than one million copies – the album eventually exceeded triple platinum. And as the newspapers heralded, Mr. Cliburn’s exclusive contract with RCA Victor was the largest monetary contract ever awarded to any musician in all of the recording industry history at that time. Advance demand for tickets to Mr. Cliburn’s first U.S. appearance after the Moscow victory outsold any previous events in the then sixty-seven-year history of Carnegie Hall. There was a near riot by fans in Philadelphia when Cliburn was discovered shopping in Wannamaker’s Department Store. 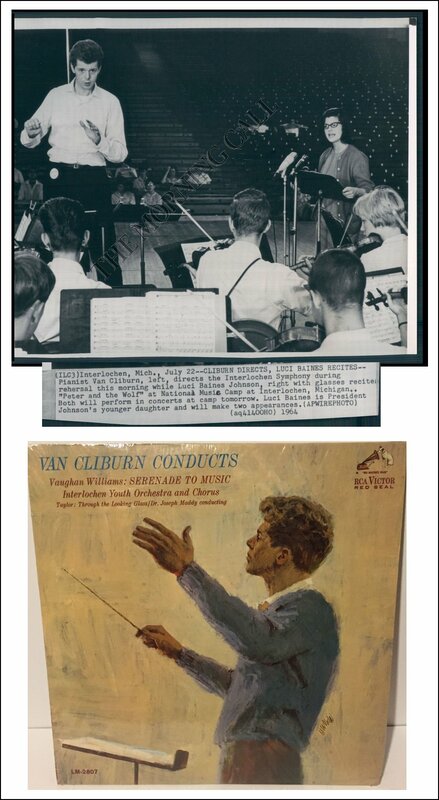 Cliburn played two concerts in Chicago’s Grant Park to an audience of over 80,000 each evening, whereupon Chicago’s Elvis Presley Fan Club changed its name to the Van Cliburn Fan Club. In November 1958, for the first time in its seventy-seven-year history, the Boston Symphony Orchestra was forced by demand for tickets to schedule a repeat performance of a concert. With Mr. Cliburn as soloist, the repeat was promptly sold out as well. 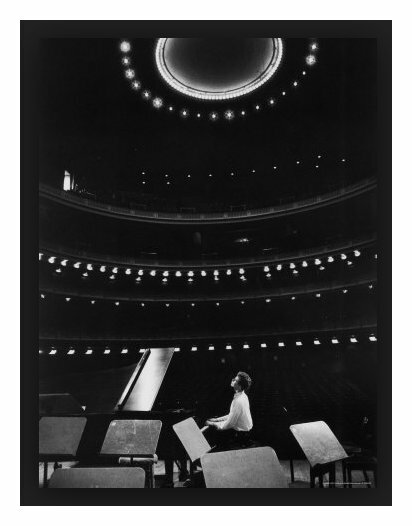 That same year, Mr. Cliburn’s concerts also set attendance records in New York at Madison Square Garden, in Pittsburgh, and in Philadelphia, in the Hollywood Bowl, and all at the highest prices ever charged for such events. Van Cliburn turned down two Hollywood offers to star in films – one of which was about Franz Liszt. Mr. Cliburn’s fame was acknowledged in the Peanuts comic strip. In June, 1994, at a special concert at Grant Park with the Chicago Symphony with Maestro Leonard Slatkin, newspapers reported that according to police estimates, 350,000 people were in attendance. Van Cliburn’s superstar status in both the United States and Russia catapulted him into a decades-long role as unofficial diplomat and ambassador of art in the midst of the Cold War and beyond. He has played for every American president since Truman. His performance in the Reagan White House also included President Mikhail Gorbachev and his wife Raisa in the audience and was part of a summit meeting between the two leaders who eventually ended the Cold War. Mr. Cliburn received the Grammy Lifetime Achievement Award in 2004. 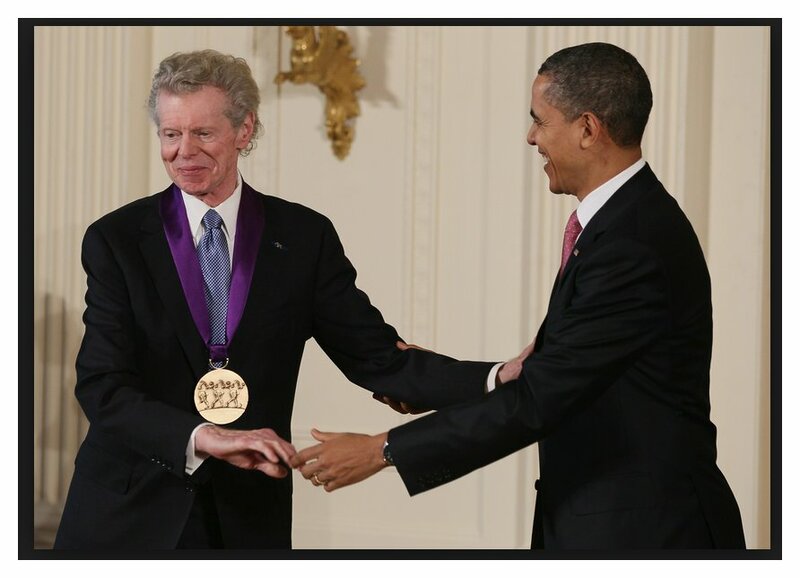 In 2011, President Barack Obama awarded Van Cliburn the National Medal of the Arts. -- Text from the Cliburn Website. Photos from various sources. This conversation was recorded in Chicago on June 16, 1994. Portions were broadcast on WNIB four months later, and again in 1999. This transcription was made in 2016, and posted on this website at that time.